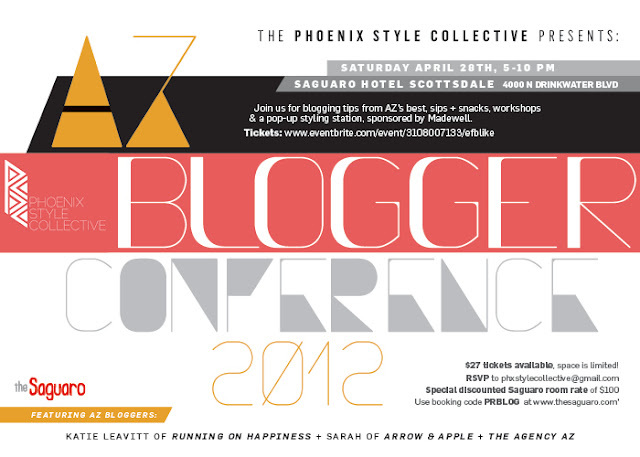 For those of you who haven't purchased a ticket to the Arizona Blogger Conference this weekend, I highly suggest you hurry up and do it! Our tickets are almost sold out. Below are the awesome attractions and activities you have to look forward to if you're attending, which I stole off of the Phoenix Style Collective Blog. If you have any questions, don't hesitate to ask! -Each ticket purchase includes one raffle ticket for some amazing prizes, and there will be extra tickets available for purchase! -Tickets are selling fast, so get yours NOW! We will have a very limited number of tickets at the door for last minute attendees but please don't wait til the last minute to buy your ticket. We want to see you there! Can't wait! It's going to be so fun! It was a super fun conference and the gift bags were amazing! It was nice to meet you last night!